Due to technical difficulties, the final installment of Newly Rebellious is being postponed (though hopefully not for long); in the meantime, here’s a recipe for a nifty twist on a classic, courtesy of Cobban, a kooky friend, fabulous karaoke partner and all-around excellent guy. Cobban (whose talents include video editing, and can be seen hamming it up during a weekend home alone here – give it a watch, he’s hilarious) is very fond of Manhattans – in his words, “That sound of the ice in the shaker? Just like the cat with the can opener, for me.” However, like all professional drinkers and their favorite cocktails, he prefers his to be made in a particular fashion, with particular ingredients – in this case, Maker’s Mark bourbon. Put a bit of maraschino cherry juice along with a cherry in the bottom of your cocktail glass. Shake remaining ingredients with ice and strain into glass. Optional: Add an orange slice for extra garnish. After the Bartender waved goodbye to the last batch of guests (Rebel Houseguests? ), she discovered to her delight that they had left a present on her home bar; specifically, a bottle of Grey Goose La Poire. This particular spirit had been on her to-try list for a while – pear vodka is fairly unusual – but given its cost and her generally-unimpressed reaction to the classic Goose, it had never quite made it to an actual purchase. So what better way to try the stuff out than on someone else’s dime? Fortunately, it’s a much more interesting spirit than plain Grey Goose. Surprisingly strong and non-sweet for such a fruity spirit, it could add an extra dimension to a number of drinks, and likely wouldn’t need to be used in large quantities to do so. This Peartini recipe is an exception, designed to complement and show off La Poire’s qualities. It comes originally from the Grey Goose website, although the Bartender has done a bit of tweaking to get the sweet-sour balance just right – hence the name. Shake all (liquid) ingredients and strain into a chilled cocktail glass. Cut a thin, nearly translucent slice of pear and lay it along the inside of the glass. 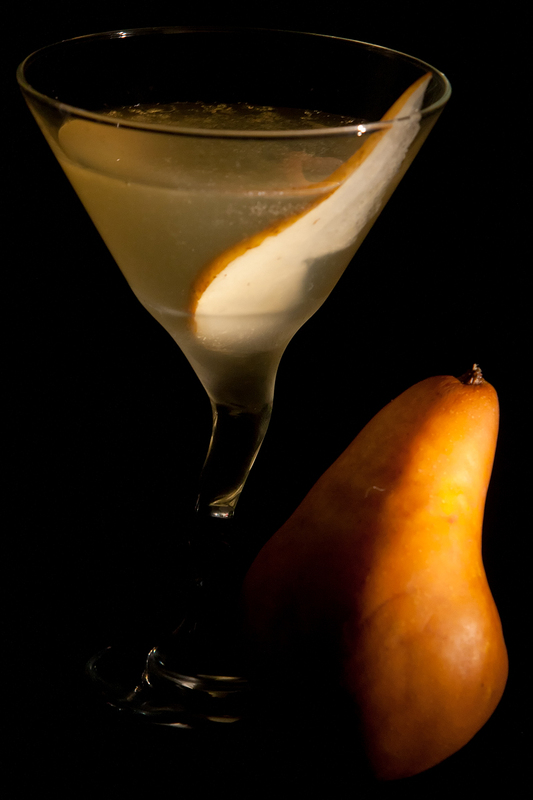 Enjoy the rest of the pear with the martini – they’re tasty! Vodka Nearly-Three-Weeks is officially over. The Bartender has enough of the stuff stocked to last her until Judgment Day. If she has to look at another vodka martini in the next six months she’s probably going to be ill. So what better way to celebrate than to have a drink based on her favorite underappreciated spirit? In all fairness, the Bohemian Bicycle (creation of Doug Levy from the marvelous Feast in Tucson, re-creation mine and fairly close to the original) is not your typical martini-with-a-twist. And while it violates the Bartender’s usual rule of keeping to ingredients that cost $30-or-less a bottle, it’s well worth it: St. Germain runs about $40, comes in a beautiful art deco bottle, and is a remarkably versatile ingredient that’s excellent for adding a touch of herby-floral sweetness to any concoction. Not to mention the sheer class derived from including a French liqueur distilled from elderflower in your ingredients. Two notes before we begin. First, this is a recipe that definitely depends on the subtleties of specific liquors for its flavor; ergo, substituting a different type of gin is not recommended. Also, note the range in the lime juice; the strength of the juice can vary significantly depending on the age of the limes involved (older limes have had much of the moisture evaporated out of them and therefore have a more concentrated flavor). The goal is for the lime flavor to give it an extra zing without being overpowering. Remember, the key word, as always, is experimentation – that’s the whole fun of it! Shake first three ingredients together and strain into chilled cocktail glass. Fill with club soda. Float shredded basil leaf on top. 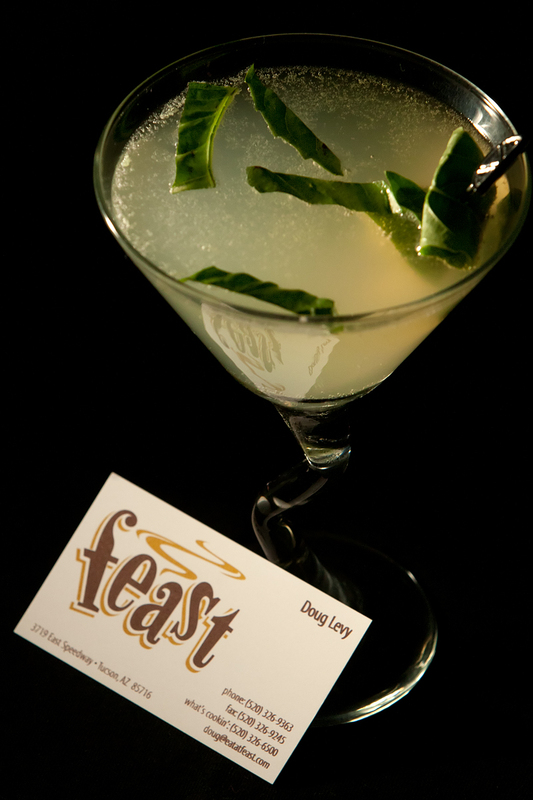 Garnish with a lime wheel, or a folded basil leaf and lime wedge on a pick. Feeling a little tired of Guinness this St. Patrick’s Day? 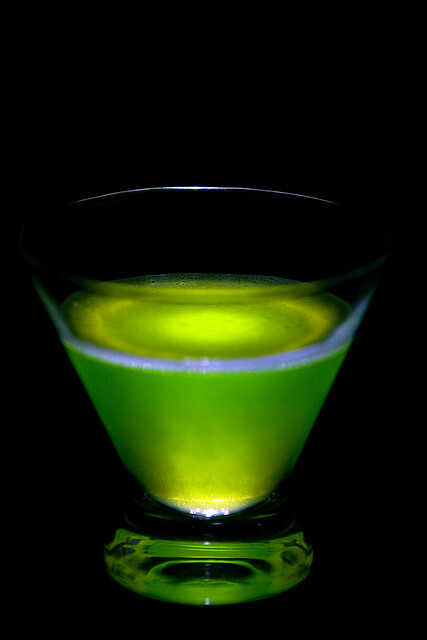 Want something similarly artificial and festive-looking but different from the standard green beer? Give this drink a go. It’s surprisingly tasty, in that FD&C Green-No.-5 kind of way. Plus the color is hilarious – the Rebel Spouse refers to it as a “Green Thing”, although that’s not technically its name. And it has the advantage of being incredibly easy to make, and thus less than intimidating even once you’ve downed a green beer or three. Shake all ingredients over ice and strain into a cocktail glass. Garnish options include the standard maraschino cherry or brightly colored soft candies – for a festive twist, see if you can find gummi shamrocks to spear on a pick. Given that it’s Vodka Week, and given that the Bartender has (until today) been short a set of shot glasses to properly freeze, she has been evaluating each in the next best medium: the vodka martini. Not only has it provided a framework within which each spirit can display its talents, but her general preference for gin martinis has assured her ability to simultaneously discern the vermouth from the spirit itself, judge how the two combine (if at all), and also to analyze how the vodka versions stack up in terms of overall flavor. The vodka martini is perhaps best-known as James Bond’s preferred drink, and as with so many things, Agent 007 knew exactly the right way to do it. “Ice cold” is your watchphrase here, and as we’ve learned, shaking tends to make a drink colder and slightly more diluted than stirring. Gin martinis are traditionally stirred, true, but a vodka martini both benefits from the additional chill of shaking and bears the dilution far better than its cousin. One final note: while the Bartender does not believe in bone-dry Martinis of either sort (what’s the point of making the Martini if there’s no vermouth flavor to complement the spirit? 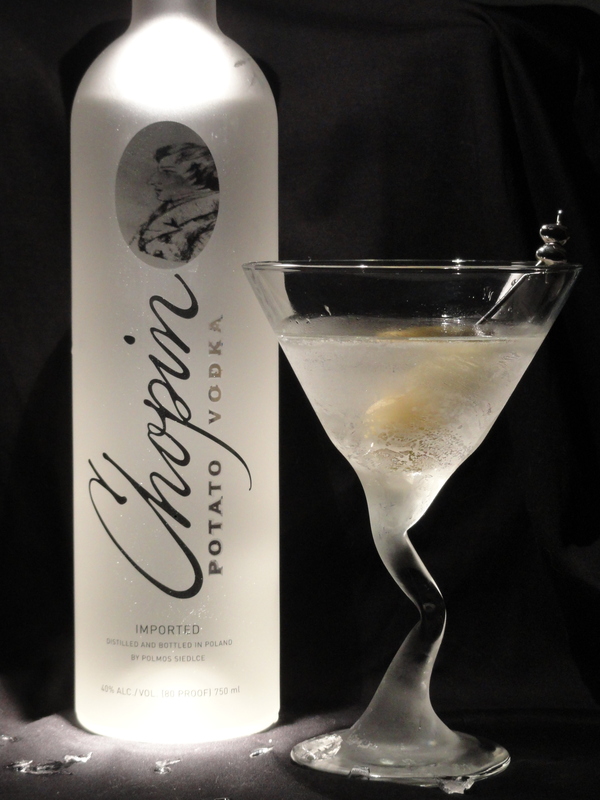 ), vodka has a naturally subtler flavor than gin, and therefore works best in a drier setting. Your ultimate preferred proportions will likely take a few tries to discover, but hey – the trial-and-error is part of the fun! Shake both ingredients with a good handful of ice and strain into chilled cocktail glass. Garnish with your favorite Martini garnish – lemon twist, olives, cocktail onion, etc. Bonus points if you manage to come up with a garnish especially appropriate to the vodka brand used. 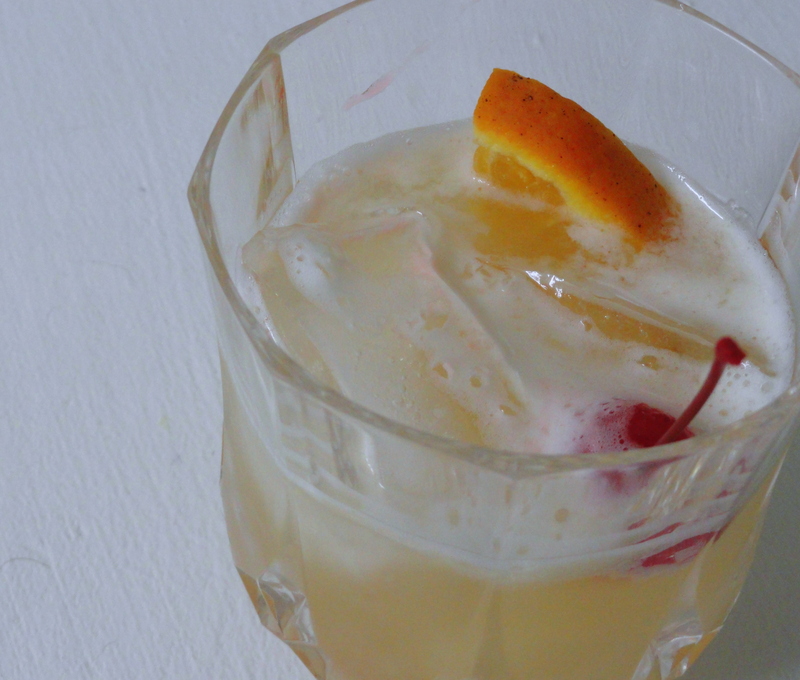 Now that we’ve addressed Jim Beam bourbon, it only seems appropriate for the Bartender to document the classic recipe it might as well have been custom-designed for – the Whiskey Sour. Note that the recipe specifies bourbon whiskey; this is not an arbitrary designation. The lemon juice helps to tamp down the sweetness and bring the sour notes of the whiskey to the forefront, while the syrup blunts its harshness. Considering the complete and utter lack of subtlety in any of the base ingredients, the result is surprisingly complex. The official recipe includes a dash of egg white in the ingredients, but there appears to be some debate as to whether or not it’s an optional inclusion; given that this is a blog dedicated to doing things for oneself rather than following tradition, the Bartender tried it and discovered that the only noticeable difference is cosmetic. Therefore, the Bartender recommends that the aspiring mixologist weigh the pleasing aesthetics of the white foam at the top against the (admittedly small) possibility of poisoning from the raw egg, and choose accordingly. Shake and strain over ice in a rocks glass. 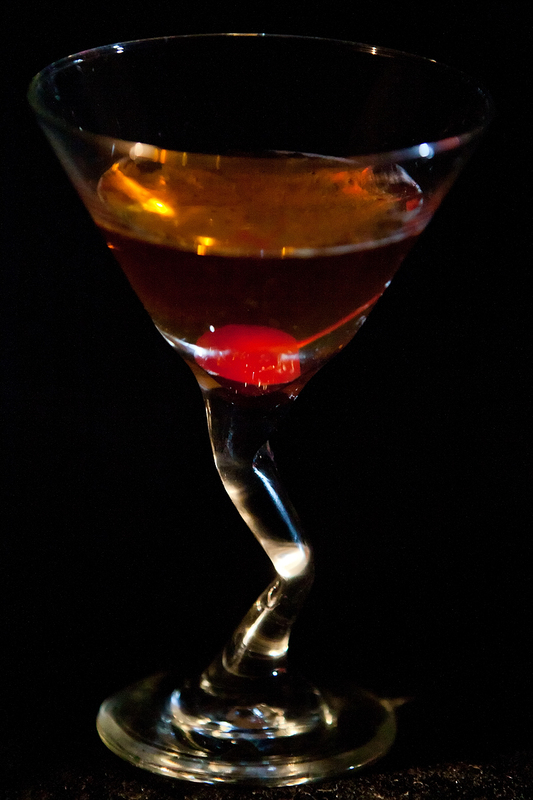 Garnish with two maraschino cherries, or a cherry and an orange slice. 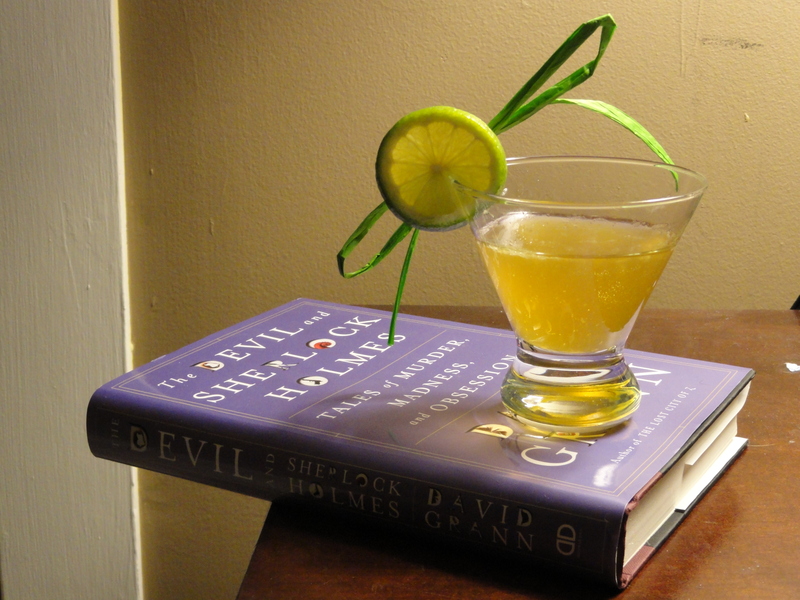 Random decorative objects can occasionally make a striking garnish. Almost everyone has heard of the Apple Martini, or Appletini, although no one can quite seem to agree on how to make it. Most versions are frankly plain in taste, and the Bartender is still working on finding one interesting enough to bear her signature. That said, this variation has a bit of pizzazz that the straight version lacks, and makes for a nice surprise when a friend expects to get plain ol’ alcohol-laced apple juice. Shake all ingredients with ice and strain into a chilled cocktail glass. Garnish options include a lime wheel, an apple slice, a vanilla bean, or the green paper ribbon bow that happens to be sitting on the bedside table. Source: The Bartender honestly can’t remember – this was one of her first real cocktail successes. Likely Drinksmixer.com, although chances are good the recipe has undergone some tweaking in the interim. $5.50 at BevMo. Quite the racket. This was originally meant to go in the post on ingredients, but it was getting a bit long. And since there’s technically some mixing going on, here’s a recipe! Syrup is to mixologists what white paint is to an artist – it has no flavor of its own, but it lightens and sweetens any mixture you add it to. Given its usefulness and convenience (no stirring like crazy to dissolve sugar in a cold drink), no home bar should be without it. And it’s likely for these reasons that fancy liquor stores will often sell tiny bottles of it for outrageous sums, despite it being the easiest thing in the world to make. Really, this is all the recipe involves. The hardest part is finding a classy container; the Bartender uses a swing-top Grolsch bottle, but any sort of food-storage container will do. Bring water to boil in a small saucepan. Add sugar, stir until dissolved. Let cool and pour into a clean container of your choice. Refrigerate up to three months. This is a twist on the Cosmo that the Rebel Bartender discovered some years ago while experimenting with a bottle of Absolut Raspberri. 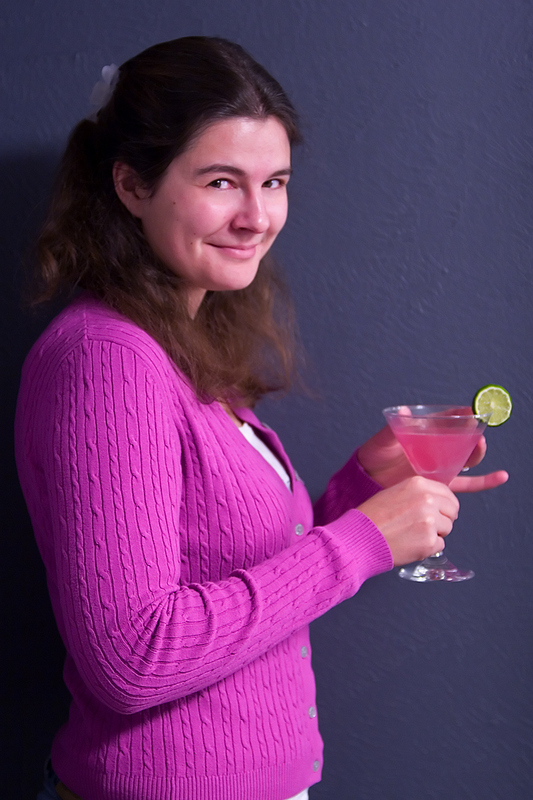 The taste isn’t what you’d call amazing – rather generic artificial-fruity – but it is noteworthy in one respect: it is quite possibly the most unutterably pink cocktail you will ever find,* both in color and (surprisingly enough) in flavor as well. And really, what better way to celebrate such a saccharine-flavored holiday than with such an artificial-looking drink? Shake with ice and strain into a chilled cocktail glass. Garnish with a lime wheel, or for a classier touch, fresh red raspberries dropped into the bottom of the glass. *The Rebel Bartender welcomes recipes challenging this assertion. Send them in for a thorough assessment and comparison, to be written up in a future post. In Search of a Stiff Drink?